Five-time winner of the Manhattan Beach Open, Mike "The Jumping Jack" O�Hara was a prominent beach volleyball player that started the game in the early 1950's. He had an impressive playing career both indoors and on the beach. O�Hara utilized his 6'4" height to get above the net and smash the ball at his opponents. During an era when the block was rarely used, Mike O�Hara utilized his height to intimidate the hitters. He would stand at the net and if the set was "on" he would reach-up and block the hitter. His utilized an indoor blocking technique that he learned while playing in College and on the National Team. O'Hara was a member of two UCLA All-American Championship volleyball teams, 1953 and 1954, and he played on three Pan American teams, winning a gold medal in 1959 and a silver in 1963. 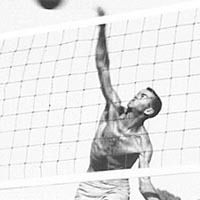 The following year, Mike represented the US in the first Olympic Games for volleyball in Tokyo, and he is one of two individuals in the history of volleyball worldwide to have been inducted into both the Beach and Indoor Volleyball Halls of Fame. Twice he was voted the Most Valuable Player in America by the US Volleyball Association, and in 1993 he won that award again in the Master's Division. In 1952, after playing 6-Man indoor volleyball with his fraternity's team, he decided to go down to the beach and play. Even though he had never played beach volleyball, he thought that he would be able to hold his own. To his surprise, he could barely hit the ball over the net. Eventually all of his training at Sorrento and State Beach paid off, when O'Hara teamed-up with Mike Bright, to form one of the best teams and "rivalries" (against Selznick) in beach volleyball history. O'Hara's first "Open" victory came with Don McMahon, at the 1954 State Beach Men�s Open. They finished second at the 1955 Laguna Beach Open. In 1956 O�Hara won the Santa Barbara Open with McMahon along with a second place finish at the 1956 State Beach Open. He also finished second at the 1956 Laguna Beach Open. In 1957, he won the San Diego Open with Ron Lang and finished second at the State Beach Open with McMahon. In 1958, he won the Santa Barbara Open with Barry Brown and finished second at the Laguna Beach Open with Mike Bright. After a fairly successful partnership with McMahon, and others, eventually O�Hara teamed-up with Mike Bright in 1960 for 4 event championships, including the inaugural Manhattan Beach Open. They were one of the most successful beach volleyball teams of all time. They won the first five Manhattan Beach Opens, from 1960 thru 1964. They were very successful against all of the top teams of their era. O�Hara and Bright played in 18 "Open" tournaments, winning 12 of them. On the 1961 beach volleyball circuit, O�Hara advanced to the finals 4 times, winning twice. In 1962, he reached 4 finals, winning twice. In 1963, he reached 4 finals again, this time winning 3 times. In 1964, O�Hara advanced to 4 finals, winning all of them, including his fifth Manhattan Beach Open with Mike Bright. O�Hara and Bright won 12 tournaments together. Also during the 1960's, most of the mixed-doubles tournaments were won by either Gene Selznick and Johnette Latreille or Mike O�Hara and Edie Conrad. O�Hara and Conrad were very successful at most of the Mixed-Doubles tournaments that they entered, winning whenever their top adversary, Selznick and Latreille, did not enter an event, and about half of the time when they did. Conrad�s setting ability and O�Hara�s hitting ability, formed one of the most powerful duo�s ever, on the mixed-doubles circuit. They were especially successful at the Sorrento Beach Mixed-Doubles tournament, year after year. O'Hara�s last appearance in a final came in 1966, when he did it twice. He finished in second place at the 1966 Manhattan Beach Open with Bright and at the Rosecrans Open with Pete Hogan. O�Hara�s beach volleyball career included a total of 21 championship victories. O�Hara also won numerous National Titles indoors. O'Hara took to the beach in a different manner than most beach volleyball players. Submerging himself in seminars to program his subconscious for success and winning. Sports and business were synonymous metaphors which would lead him into a career as sports impresario and promoter. There was no nonsense to be tolerated, he worked, went to night school and played on the weekends. It was all business with him, a unfamiliar component among the nonchalant group of beach volleyball players. Over the years, O�Hara has devoted his time to sports promotion. He has played a major role in developing the International Volleyball Association, and Team Cup Volleyball. O'Hara helped organize the 1984 Olympics and has continued to be involved in Olympic organizing committees since that time. In 1991, he was named Man of the Year by the Boys and Girls Club of Venice, an honor of which he is particularly proud. O'Hara has also contributed to sports through his innovations in both volleyball and basketball. As founder of the American Basketball Association, he helped research and support the introduction of the three-point play, which is now a vital ingredient in the way basketball is played around the world. As the creator/owner of Wallyball, he introduced the Rally Scoring System, which has officially been adopted by the Federation Internationale de Volleyball for use in all matches worldwide, including the Olympic Games. Currently, O�Hara continues in business with his own sports company, O'Hara Enterprises Inc., enjoying the distinction of having pioneered more college professional and Olympic sporting endeavors than any other company in history. OEI helped establish professional sports leagues in basketball, hockey, and volleyball, and created the professional track circuit internationally. And as a TV commentator, Mike has distinguished himself on the major networks, internationally covering basketball, volleyball, and water polo.